So, you’re in South Lake Tahoe and just had a satisfying day at Heavenly ski resort or spent it at another of the many winter or summer Tahoe activity offerings. The Ten Crows BBQ restaurant in South Lake Tahoe features a menu comprised of traditional southern and soulful barbecue dishes that have their origin in the deep south. The big question now lingers: What’s the plan for dinner and a few cocktails? If you’re considering barbecue, we’ve got just the place for you – Ten Crows BBQ at the Hotel Becket. The menu is comprised of traditional southern and soulful barbecue dishes that have their origin in the deep south. It’s certainly not the fanciest restaurant in Tahoe’s south shore – far from it. But Ten Crows BBQ has a wonderful ambiance, friendly clientele, and the employees are nice and extremely efficient. Oh yeah, and the barbecue offerings are awfully tasty. If you happen to be a fan of wings, Ten Crows BBQ will more than satisfy your craving. The house-smoked wings are extremely meaty, so there’s no lack of chicken on those bones. And there’s plenty of variety with a choice of mild, bold, sweet chili, buffalo, comeback sauce, Alabama White or Carolina Gold. Other notable “starters” include a big plate of nachos, fried pickles, pork rinds and Buffalo cauliflower. New in late January was Prime Rib Tuesday. Intrigued by the offering, we went for it and were extremely pleased. We were told that the juicy prime ribs are smoked in the deep fryer for 14 hours. Judging from its first night on the menu, patrons may want to arrive early for Prime Rib Tuesday. On its debut evening the prime rib was gone by 7:30 pm. Other interesting entree items include smoked salmon, tri-tip, beef brisket, pork ribs, and build-your-own mac and cheese. Sandwiches are another popular menu item. They include tri-tip, BBQ pulled pork or chicken, and veggie burger. Sides like smoked garlic mashed potatoes (they were delicious), house-cut fries, baked beans, house salad, and jalapeño corn bread come with the entree, sandwich or can be order separately. There’s also a kids’ menu. Ten Crows BBQ restaurant has a bar area with a great vibe and features craft cocktails and beer. Ten Crows BBQ fits well into the Tahoe scene. It’s casual dining with a laid-back atmosphere. Even though there’s nightly music, the volume never gets too loud that one can’t enjoy a nice conversation. Note that the solo guitarist during our visit was excellent. His repertoire included a little country, mellow rock, and even a Pink Floyd tune. 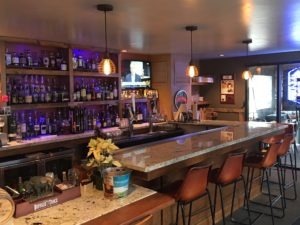 From what we observed, Ten Crows BBQ is a favorite stop-off for Tahoe restaurant employees, which typically means the place has a big-time stamp of approval from people who really enjoy good food and cocktails. In the warmer months, there’s outdoor seating, a fire pit and game area (corn hole & large jenga), plus a gorgeous view of the mountains. Speaking of libations, bartenders like the highly-efficient and friendly Jeannette can make a wide variety of interesting cocktails and the restaurant has some a strong selection of craft beers. 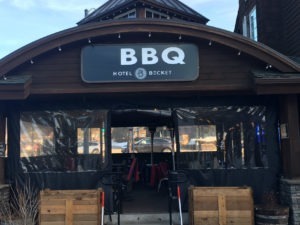 Ten Crows BBQ is attached to the Becket Hotel (we recommend staying here) and conveniently located across the street from Heavenly Village at 4011 Lake Tahoe Blvd. For more information, visit the website at www.10crows.com or call 530 539-4064.